My class CS 6470 Design of Online Communities is structured around having students do a qualitative study of an online community using participant observation and interviewing. Over the years since I first taught the class in 1998, the core assignment has evolved in a number of ways. One recent change that surprised me is the need rethink the assignment’s focus on a single site. 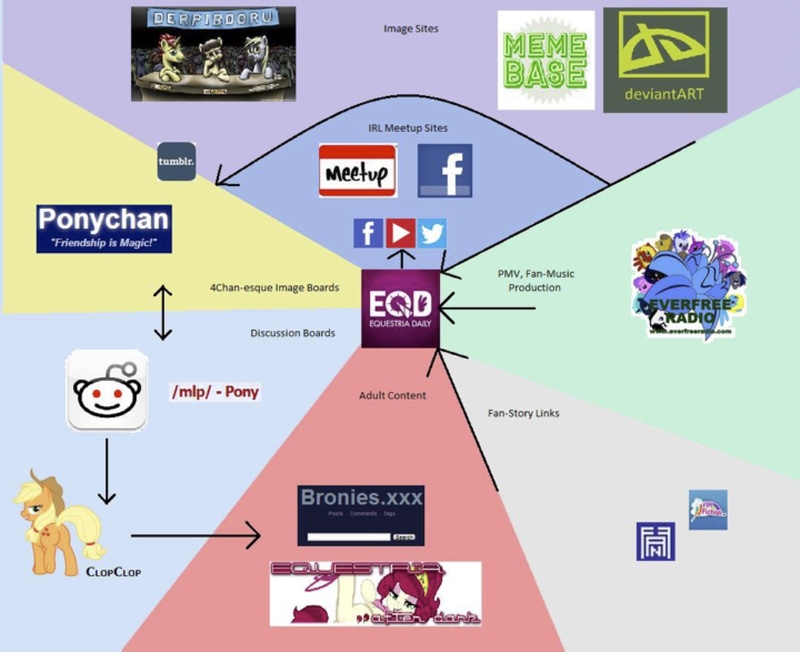 Taken together, brony online activity forms a kind of ecosystem. Too many people talking about ponies on 4chan led the creation of Ponychan. A policy change in what sort of content is allowed on Equestria Daily changed what is posted on Equestria After Dark. Pony fans use all these different sites in a complimentary fashion, and user behavior is not confined to one site. In fact it’s impossible to tell the story of Equestria Daily without explaining its relationship to this ecosystem of pony activity. As you’ve probably noticed, much of this activity is oriented towards “adult” content. Any cultural content that inspires dedicated fans can be repurposed towards erotica. It’s not surprising that a cultural meme that tends to appeal to individuals in a more typically libidinous stage of life would be used in this fashion. And as these things go, pony erotica tends to be relatively tame. I certainly see less potential harm in original art about ponies compared to adult content made from photography of real people who may or may not have been exploited in the taking or eventual use of their images. The need to think about ecosystems of online sites is not specific to bronies. I was meeting recently with my colleague Alex Orso to discuss his online software engineering class in our online master of computer science degree program (OMS), and he lamented that supporting his course involves using half a dozen different tools. There’s our institutional grading software, our vendor’s class delivery platform, our normal class support software, a third-party class discussion tool, a software repository…. Saying you would study “the software” or “the website” for OMS is an anachronism. There are many platforms and tools, and the challenges are all at the seams between them. Similarly, my student Joseph Gonzales is studying The Greatest International Scavenger Hunt the World Has Ever Seen (GISHWHES), and finding that teams of hunters all use a host of different tools and change their tool use through different phases of their project. It doesn’t surprise me that people use multiple tools and online sites. It does surprise me that this happens to a degree that it can be hard to even discuss one single site in isolation. Time to rewrite that class assignment! Thanks to Patrick, Michael, and Aditya for a great project!